To Cite: Tahmasbi S, Kabiri S, Mohammad Rabei E. Rootless but Erupted Teeth: Interesting Trait of Dentin Dysplasia Type I, Iran J Ortho. 2017 ; 12(1):e6419. doi: 10.5812/ijo.6419. Introduction: Tooth eruption is a complex procedure and many theories has been proposed to describe the nature of this process. Some studies, have shown that in contrast to traditional thoughts, root development is not necessary for tooth eruption and have been focused on the role of dental follicle. Eruption of the permanent teeth with no or little root development has been reported in a few cases. Dentin dysplasia is a rare genetic disorder of the teeth that affect dentin formation. Dentin dysplasia type I or radicular dentin dysplasia is characterized by normal appearance of crowns, but severe tooth mobility. Radiographically, very short or absent roots, periapical lesions and spontaneous pulp obliteration are seen. Case Presentation: This paper describes two patient with dentin dysplasia type I that despite of rootless tooth, normal eruption has occurred. Conclusions: These cases are good example to support that eruption procedure is an independent event from root formation. Tooth eruption is a complex physiologic procedure that results in tooth movement through alveolar bone to functional position in oral cavity (1). Many studies examined tooth eruption in animals and human and several theories have been suggested; however complete understanding of eruption mechanism has not been achieved yet (2). Tooth eruption theories include addition of bone to alveolar process, root elongation, periodontal ligament development and increased capillary pressure in the pulp or periapical area (2-4). Furthermore, some experimental studies have been focused on the role of dental follicle in tooth eruption and demonstrated that removal of dental follicle prevents the normal eruption (5-7). Some studies, have shown that in contrast to traditional thoughts, root development is not necessary for tooth eruption (8). Eruption of the permanent teeth with no or little root development has been reported in few cases (1, 8-10). Dentin dysplasia type I is a condition in which underdevelopment of the roots is seen in accordance with normal eruption. Dentin dysplasia is an autosomal dominant hereditary situation that affects dentin formation. It occurs in about 1 in 100000 live births. Generally this disorder is divided into two categories according to clinical and radiographic characteristics. In Dentin dysplasia type I (DDI) or radicular dentin dysplasia, clinical examination shows normal appearance of enamel without malformation and discoloration of crown but severe tooth mobility that usually leads to premature exfoliation (11). Radiographically, extremely short or absent roots, periapical lesions and spontaneous pulp obliteration are seen, nevertheless tooth eruption is often unaffected. However delayed eruption has also been reported. In dentin dysplasia type II or “coronal dentin dysplasia”, both of crown and root have normal appearance. In radiographic examination, large pulp chamber is obvious, but after completion of eruption process, continued deposition of abnormal dentin and pulp obliteration occurs (11, 12). This paper describes two patients with DD type I that despite severe root formation defects, normal tooth eruption has been occurred. 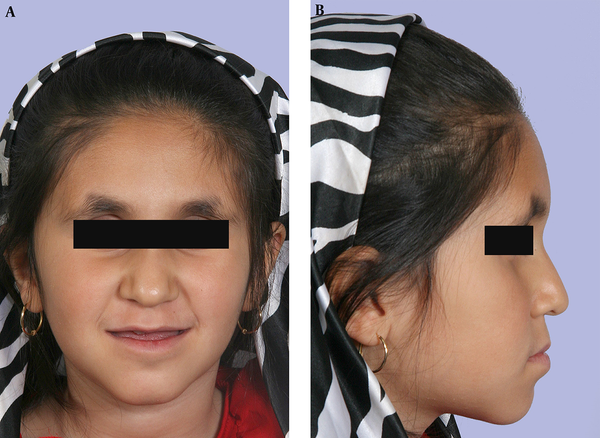 A ten-year-old girl was referred with the chief complaint of tooth mobility to Shahid Beheshti dental school. The patient showed underdeveloped body stature and had a 7-year-old bone age according to hand wrist radiograph. Laboratory tests, including hematologic analysis, calcium, alkaline phosphatase and PTH serum level, were normal. She had no familial history of dentin dysplasia or other hereditary disorders. Extraoral findings showed a convex profile, competent lips and nonexposed teeth at smile (Figure 1). Intraoral examination showed class III angle classification with 8-mm anterior open bite and occlusal contact just on molars (Figure 2). Due to severe mobility of the teeth, the patient’s oral hygiene was poor and her nutrition was adversely affected. In panoramic examination all permanent teeth were present except the lower right first molar which was previously extracted. All of teeth had extremely short and tapered roots with obliterated root canals and pulp chambers. All of them except the upper left central incisor had normal eruption despite the short roots. 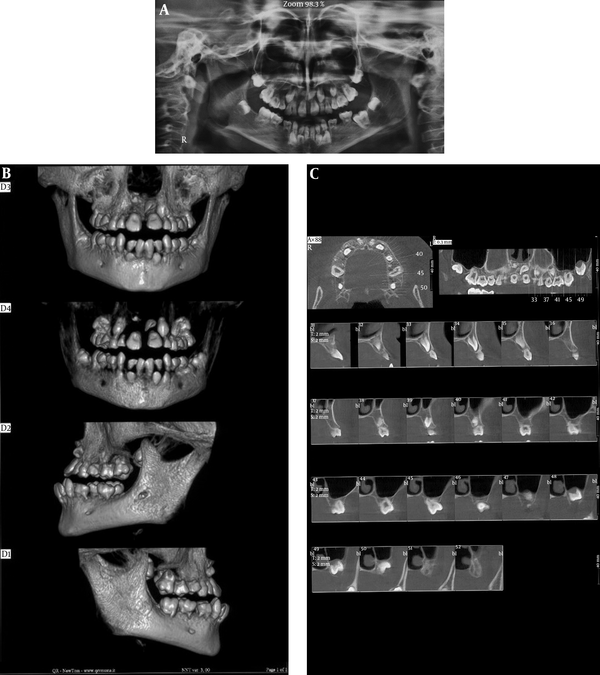 Interestingly the upper right central incisor bud which was horizontally oriented at age 9 was corrected spontaneously and erupted during 15 months (Figure 3). Figure 1. 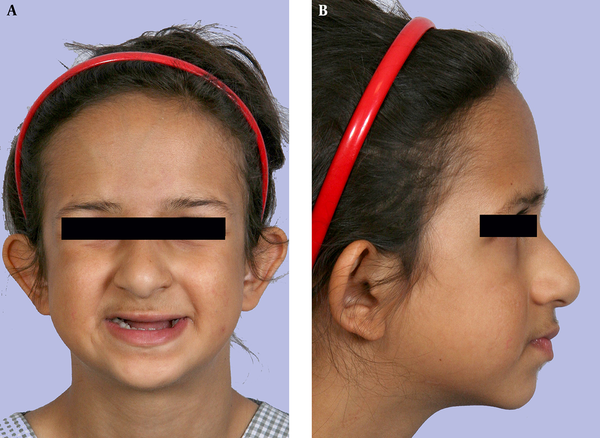 Case I: The Patient Had a Nonexposed Teeth and Gingiva at Smile, A, frontal view; B, lateral view. Figure 3. A, Panoramic radiograph of case I at 9 years. Note the short and tapered roots with obliterated root canals and pulp chambers upper right central incisor had a horizontal eruption pattern and left one is upside down. B. Panoramic radiograph of case I at age 10-eruption pattern of upper right central incisor has been corrected and the tooth has erupted successfully. According to clinical and radiographical findings the diagnosis of DD I was established. A ten-year-old girl was referred with a complaint of over-retained deciduous teeth and tooth mobility. Extraoral findings showed enophthalmus and midface deficiency with almost straight profile. The patient had nonexposed teeth at smile (Figure 4). Intraoral examination showed normal occlusal morphology but hypermobility of the teeth. The patient showed a dental age of 7 with eruption of only permanent central incisors and first molars except lower left first molar. Oral hygiene was poor (Figure 5). Figure 4. Extraoral Photographs of Case II, A, note the nonexposed teeth and gingiva at smile. B, midface deficiency is apparent. Figure 5. Intraoral Photographs of Case II, The patient showed a dental age of 7 with eruption of only permanent central incisors and first molars except lower left first molar. All teeth showed normal morphology and had erupted completely. Radiographic examination disclosed missing of maxillary right lateral incisor and all premolars except maxillary left second one. CBCT and panoramic radiographs showed very short roots of permanent and deciduous teeth with normal pulp chambers and ectopic eruption pattern of maxillary right lateral incisor (Figure 6). Her aunt was reported to have the same condition of rootless teeth and had extracted all of her teeth at age 32 and undergone jaw reconstruction and implant placement. Figure 6. Panoramic and CBCT Radiographs of Case II, Note the erupted teeth which have very short roots. patient shows the dental age of seven. In dentin dysplasia type I, dentin formation is affected and roots tend to be blunt and very short, so this anomaly is usually described as “rootless teeth” in literature. Despite these underdeveloped roots, tooth eruption is often normal and unaffected. This situation contradicts the theories that believe in root development or vascular pressure in pulp and periapical area as the basic mechanism of the tooth eruption and in cases of root formation defects these theories are incapable of describing tooth eruption mechanism. Animal experimental studies support the importance of dental follicle and specific role of innervation for the eruption process (13). Mark in 1984 conducted a study to examine the role of tooth in eruption process and concluded that tooth eruption is a series of metabolic events that characterized by bone remodeling around the dental follicle and the teeth do not play a role in this procedure (2, 13). Other studies confirmed the importance of dental follicle in eruption process and indicated that it controls the localized metabolic activities necessary for tooth eruption (14). They also described samples of rootless teeth that have been successfully erupted (6, 15). It has bee reported that tooth eruption has occurred in presence of root formation defects caused by irradiation (10). This advocates that root formation and pulp proliferation are not essential for tooth eruption. Failure of resorption activity of the overlying bone by dental folliclemay cause the eruption to be ceased (9). Recently, it has been suggested that pressure in the tooth apex provoked by innervation may result in tooth eruption. Eruption process requires the close coordination of periodontal ligament adaptation, active movement of the crown and resorption of overlying tissues. In Summary, the membrane covering the apical part of the tooth root, the periodontal membrane, and the crown follicle are the three structures, which are involved in the eruption process (15).